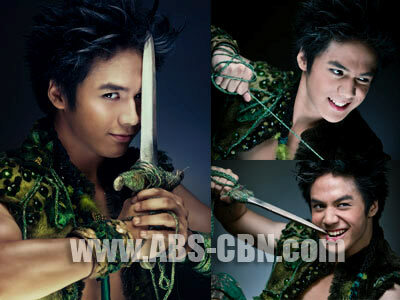 Sam Concepcion plays a different kind of Peter Pan in a play this September. This year has definitely been a busy and exciting year for Star Magic talent Sam Concepcion. The 18-year-old actor-singer recently got the experience of a lifetime being front act for concerts of international singing sensations Taylor Swift and Miley Cyrus. He is currently seen in the weekend teen-oriented show Good Vibes. He is also busy preparing for the month-long run of the STAGES and Repertory Philippines production of Peter Pan this coming September. “Honestly this year has been so great because I get to do different things at the same time. Through music I’m also able to act then I was the front act for Miley Cyrus and then I also get to act in TV and in the movie with the cast of Mara Clara. And then I also get to do theater this year which I’m really excited about,” he shared with Push.com.ph. Although he has already been involved in a variety of theater productions from The Lion, The Witch, and the Wardrobe to High School Musical, it is going to be Sam’s first time to play a unique version of the beloved children’s book character. “It’s going to be a different Peter Pan because it’s not the usual Peter Pan that we know. What’s so exciting about this is that it’s a little bit mature, a little bit older, the cast is older din. A little bit darker, not like the Disney kind of Peter Pan. Mas may depth siya. We’re going to have a lot of shows, probably 30 shows from September to October. One whole month of just shows,” he said. To prepare for the show, Sam said he has been getting further inspiration from the arts. “I listen to all kinds of music. I keep my mind open to all kinds of music and different genres. Just be open to variety and be diverse. I believe that I should take whatever things that inspire me and then put them together and that makes me who I am now,” he explained to Push.com.ph. Sam said he also enjoys his role as Marc in Good Vibes, which has been dubbed as a teen dance musical drama anthology. “It’s been great so far. Our show has been extended so I’m really, really thankful to all the fans. It’s a big show, it has a huge following sa mga teenagers. What we do is just pool our talent and our ideas together to present something that hopefully that can inspire them and that it’s something they can relate to as teenagers because on the show we tackle usual situations and problems that teenagers face,” he said. Off the set, Sam said he makes sure that he still prioritizes his education even with all the projects he has at the moment. “I’m home-schooled and it’s computer-based. What’s good about home schooling is that you can do it at your own pace and it fits into the whole lifestyle. I’m in 11th grade and I’ve been home-schooled since I was in 8th grade. It’s also a different kind of discipline,” he admitted.